I had a 7am meeting yesterday and by 4pm, my brain was just mushy. I wanted to get outside (sun!!) and walk the dog and workout and have a nice, relaxing evening. I hopped in the car only to find out one of my favorite Big Brother couples (Elana Davies and Mark Jansen) split. I promptly downloaded her new podcast to learn more and she immediately called out her listeners for their nosey-ness. Spot-on, sister. I’m a total sucker for reality TV. I listened in on the podcast while walking the dog. But, she was basically unwilling to walk, eyeing the sunny front porch instead. So, I left her there and moved on to my workout…which I opted for on the Peloton because I’m competitive like that and leaderboard friends are showing me up. But first, I had to open each of the 3 packages that arrived yesterday because I’ve become a professional online shopper. UPS knows me by name with my 1-2 weekly visits to send back much of what I buy online. Perhaps there are perks to living in middle America without a mall! Now, if only I would start trying on outfits. I’ve got our itinerary all done and I’ll need to pack appropriately. I’ve never taken a 10 day vacation but my mind immediately jumps to premonitions of me schlepping through the airport (to the very last gate in the terminal, no doubt) with way too much in my carry-on AND personal item…only after redistributing some of my over-sized luggage weight into Mark’s checked bag, at which point we will certainly be the last ones to the gate and nearly missing our flight. Anxiety-provoking! While they agree on their love for kiwi, mango is a different story. Shea loves it, Piper hates it. However, we all loved this meal and all of us were happy to absorb Piper’s unwanted mango salsa (silly, silly girl). 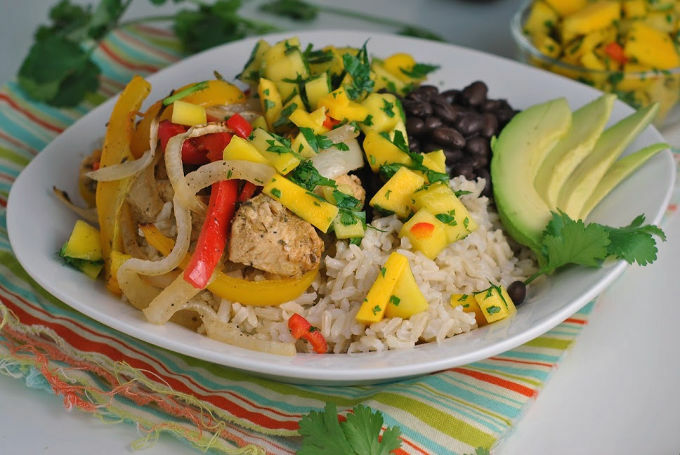 The combination of flavors (don’t skip the lime and orange zest and juice!) was bold and unique and the sum was greater than the parts…and all made on a sheet pan! 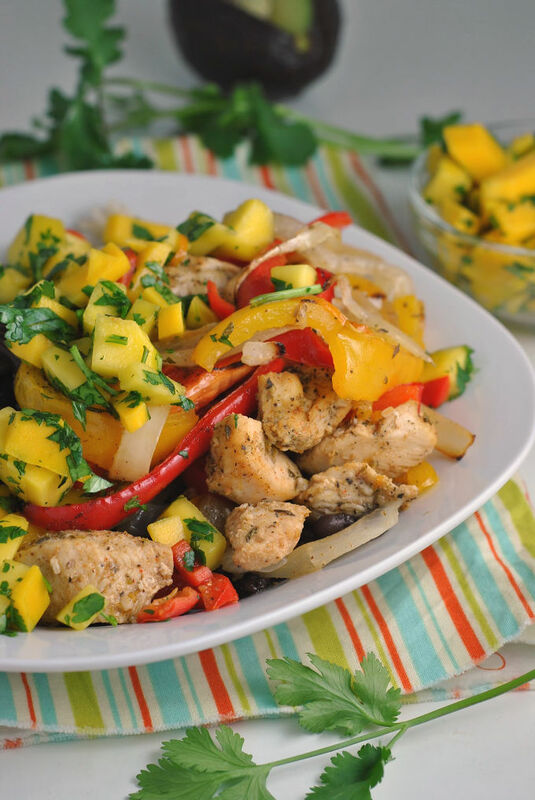 On a rimmed baking sheet, combine the chicken, 2 tablespoons olive oil, soy sauce, garlic, oregano, cumin, cayenne, orange juice and zest, and lime juice and zest, salt, and pepper. Toss well to coat. Add the onions and bell peppers and toss with the remaining 2 tablespoons olive oil. Spread chicken and vegetables in an even layer. Roast for 20-25 minutes, tossing halfway through, cooking until the chicken is cooked through. Meanwhile, combine all ingredients for the salsa in a bowl and toss to combine. 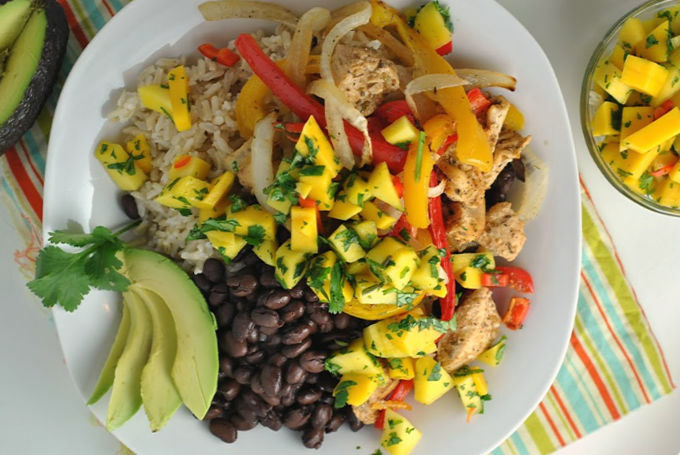 To serve, spoon ¾ cup rice into bowls and top with black beans, chicken, peppers, and onions. 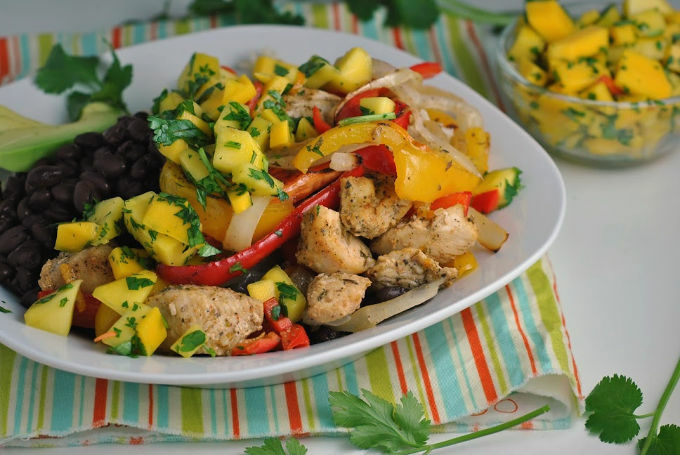 Add avocado and the mango salsa to each bowl and serve. Happy RD Day to my fellow dietitians! !